Japanese architect Makoto Tanijiri, founder of Hiroshima-based architecture practice Suppose, has created The Nature Factory, an installation for the Diesel Denim Gallery in Tokyo. It uses mundane white plastic plumbing pipes for its basic parts, but the outcome is anything but ordinary.The concept of the installation is based on a single idea “The Garden”, a walk through nature, while the PVC plumbing pipe tree grows into the store. The idea is a plastic tree which has grown over time and has covered the stores ceiling and walls with its branches. An atmosphere like a natural axis is created in the space covered by artificial plumbing. The plumbing and the light effects give off amazing scenographic shadows on the wooden floors and the polished cement slab walls. The white plumbing pipes have an amazing contrast with the black ceiling when the visitor looks up to see the shapes that the growing branches form. 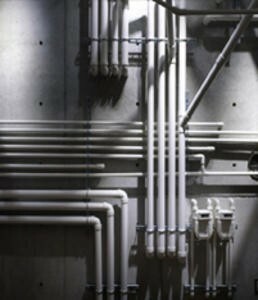 The new attractive scenery is presented with plumbing and fashion items to primarily show how functional objects, like PVC plumbing pipes, have diverse usage and a higher value when creativity gives these simple objects a whole new meaning.